Leah trained in Cognitive Hypnotherapy and Neuro-linguistic Programming in London at The Quest Institute from 2006 to 2007. The course work focused on Neuro Science, Cognitive approaches, Humanistic Psychology, Psychodynamic theory, Evolutionary Psychology, Personality Theory and Behaviourist Theory. Leah has twelve years experience working in the Health and Social Services sector in Melbourne and London. This experience has provided a compassionate understanding of the kinds of challenges that people can face in their lifetime. She worked in Alcohol and Drug treatment for a decade and supported adults and adolescents to engage in a broad range of medical and social treatment methods. Here she gained an extensive knowledge of how addictions and other mental health issues often result from long term psycho-social dynamics. She became fascinated with the healing power of Hypnotherapy, Neuro-linguistic Programming and Emotional Freedom Techniques to help people improve their health and well being. These therapies deal with the underlying emotional issues that conventional talking therapies can sometimes overlook. 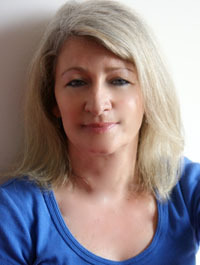 She completed her training with EFT Universe in 2014, to become an Intermediate Practitioner of Emotional Freedom Techniques. Their website at www.eftuniverse.com provides many free videos in the resources section, on the left hand side of the home page. They explain and demonstrate the positive impact of EFT. You can view people talking through a wide range of personal issues and tapping on acupressure points to reduce stress and tension in their mind and body. It is quite remarkable how the changes can happen so quickly. EFT is a form of Energy Psychology that encompasses many techniques to enhance the bodies natural energy system and bring about a balance of mind, body and emotion. Her Reiki training with Om Reiki in Melbourne has provided a meditation practice that supports her role as a healer. Leah Stevens © 2019. All Rights Reserved.